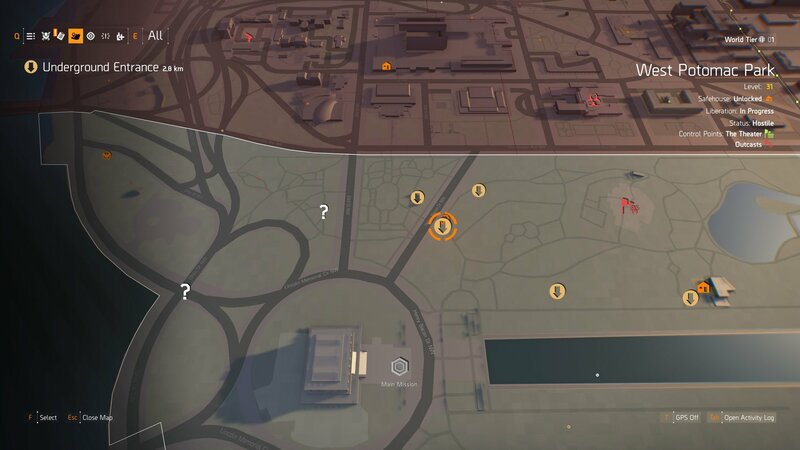 There is a ton of content available to players in The Division 2’s endgame and learning how to get all 12 Hunter Masks is just one thing players can do. If you want to acquire these secret collectible cosmetic items, though, then the tasks ahead are quite trying. This guide will break down everything you need to know to get all of the Hunter Masks, which you can then use to show off your skill to other players. Since the Hunters all spawn at level 35, players will want to wait until they reach level 30 and start the endgame. We’d also suggest putting some time into upping your Gear Score as well, as the Hunters are no joke when it comes to taking them down. 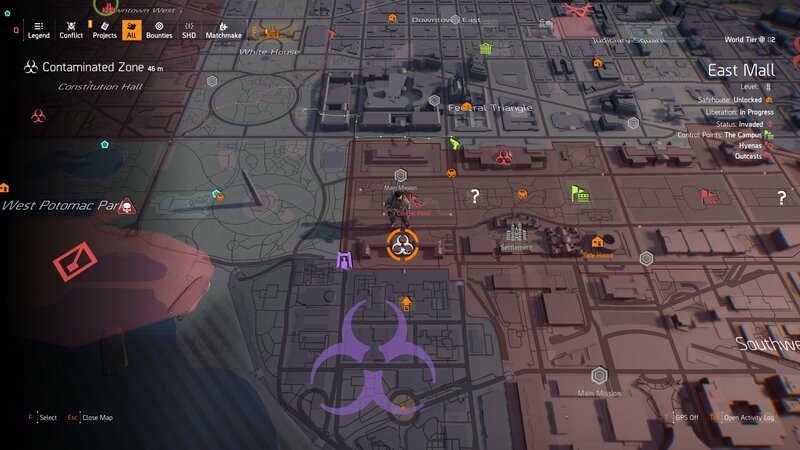 While there have been mixed reports about whether you can complete the objectives below at night or during the day, we’d suggest grabbing each of the masks at night, just to avoid any possible issues. Having trouble reaching max level? 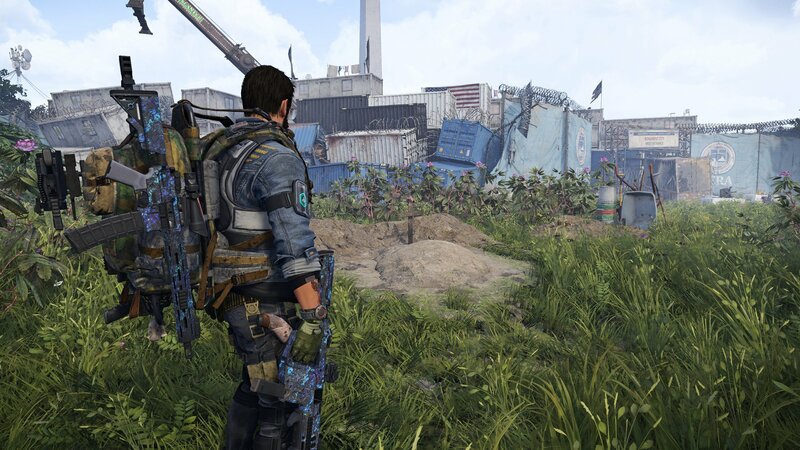 Here’s what you need to know to level up quickly in The Division 2. The first mask that you’re going to unlock is the Ghost Mask. This one is a bit more involved than some of the others. To start off you’re going to need to solve a map puzzle, which we’ve outlined below. Here’s everything you need to do to get the Ghost Mask in The Division 2. 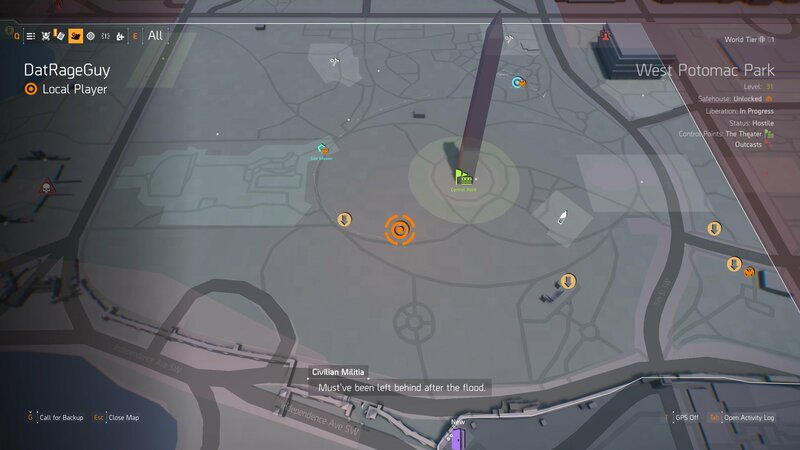 First, you’re going to want to take back the Control Point that rests on the Washington Monument. Once you’ve laid claim to it, you can head down the elevator shaft to the Supply Room, where you’ll find a small screen that you can interact with (just behind where you find the Bill of Rights collectible). Interacting with the button beneath this monitor will showcase three coordinates on the display. Activating the switch in the bottom of the Washingtom Monument will give you three locations you need to visit. One thing worth mentioning before we continue, though, is that these steps can only be completed at night. Because of this, wait until after 7PM (19:00) in-game time. You can check the time by bringing up Photo Mode from the menu and looking in the top right-hand corner of the UI. These locations on the display are three graves that players will need to visit and salute using the emote. Each time that you salute one, your UI will get a bit of static over it, letting you know that you’ve completed the step. 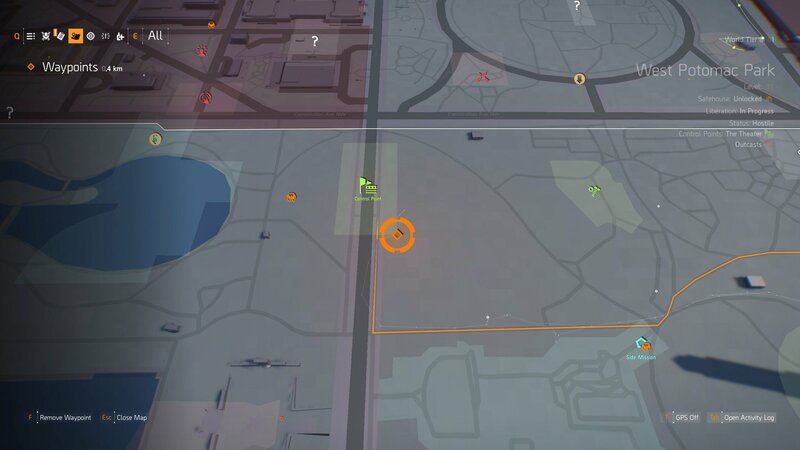 This can be very easy to miss if you aren’t paying attention, so make sure you’re watching your minimap to see the static. 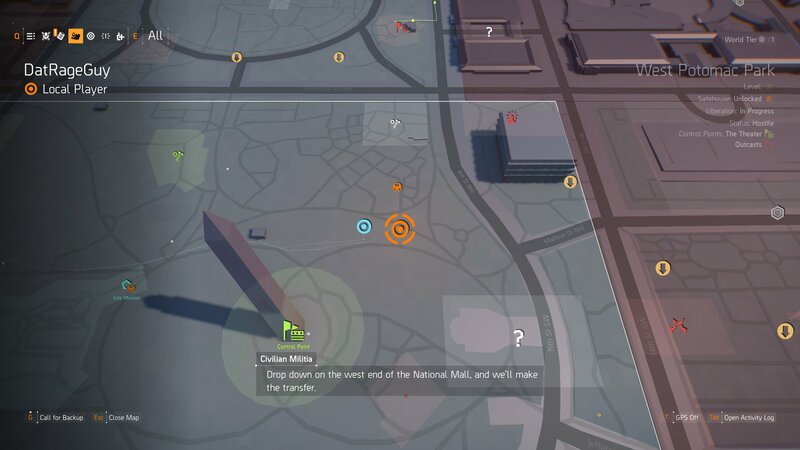 The first location can be found just southeast of the control point to the northwest of the Washington Monument. You should be able to spot the mound of dirt that marks the grave when you get near the pile of shipping containers. You can find the first grave right outside this control point northwest of the Washington Monument. The second grave’s location can be found to the northeast of the Washington Monument. Head to the area marked on the map below, and then look for a grave off to the side of the main path. The second grave you need to salute is northeast of the monument's Control Point at these coordinates. The third location can be found by heading southwest of the Washington Monument. Along the trail you should see a series of bushes between the path and the monument itself. This grave is positioned almost perfectly with a view of the monument between the bushes. Visit the location marked on this map to find the third grave you need to salute. When you have saluted all three of the graves, head back to the Washington Monument and make your way down to the Supply Room once more. Head to the screen where the coordinates were displayed and interact with the button again. This will cause the screen to be filled with the orange glow of the Division’s insignia, marking that you’ve completed the first step. Now that you’ve saluted the graves, ensure it’s still nighttime, and then make your way outside of the Washington Monument. Outside you should see a red/orange circle made up of lights on the ground. Enter the circle and the Ghost Hunter will spawn nearby. Fight him and kill him to acquire the Ghost Mask. The second mask that you can unlock is the Specter Mask. To unlock this mask, you’re going to need to make your way down to the containment area in East Mall, just south of the Metro Ruins Control Point. Here you’ll find a building covered in yellow tarps and barriers. Head to this contaminated area if you wish to take on this Hunter. If you face the front of the building, you’ll see a series of windows, some of which appear to have blinds in them. To spawn this Hunter, you’re going to need to shoot the windows in the correct order. Starting from the bottom, shoot the windows from left to right. Make sure to skip the windows that do not appear to have a blinds in them. 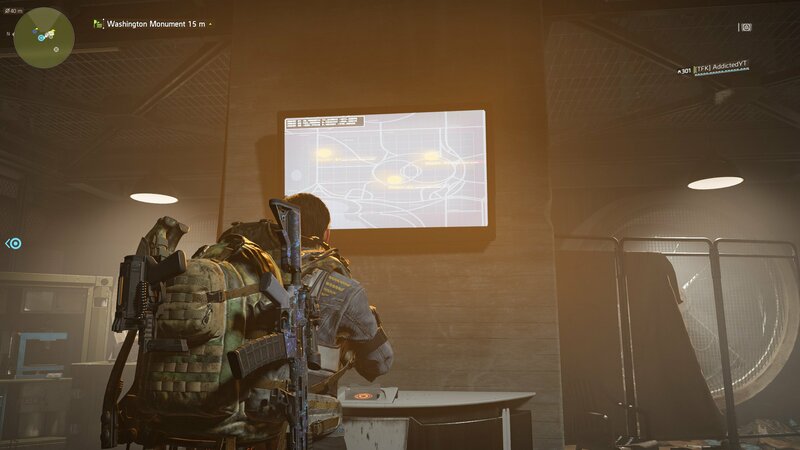 For reference, we’ve included an image of the windows below, as well as marked them with the correct order that we shot them in to spawn the Hunter that drops this mask. While there are a few supposed methods out there, shooting the windows in this order is how we were able to spawn this Hunter. Unfortunately, many players have reported there being an issue getting this particular mask, with some unable to trigger the Hunter’s spawn despite following the pattern of windows listed above. I ran into this issue when trying to pick up the Specter Mask myself and was able to combat it by changing lobbies. You can change instances by either matchmaking into another open world exploration, or by logging out and then back into the game. It’s an annoying issue to have, but I was able to pull off the pattern and kill the Hunter after a few tries. The next mask that we’ll cover is the Ghoul Mask. Like the Ghost and Spectre Masks, this mask will require a little bit of work on the player’s part. First, head to the location we’ve marked on the map below. This is a sewer entrance just north of the Lincoln Memorial mission. Head inside and then follow the tunnels to a small safe house-like area, where you should find a laptop. Head into this underground entrance to find a room with a laptop that will give you more details on where to find the Ghoul Mask. Interacting with the laptop will trigger a light to appear, shining on a map that’s pinned to the wall. There are two marks on this map. The first mark is the location that you’re at now. It also has an image of a crescent moon drawn above it, signaling that you need to complete this at night. 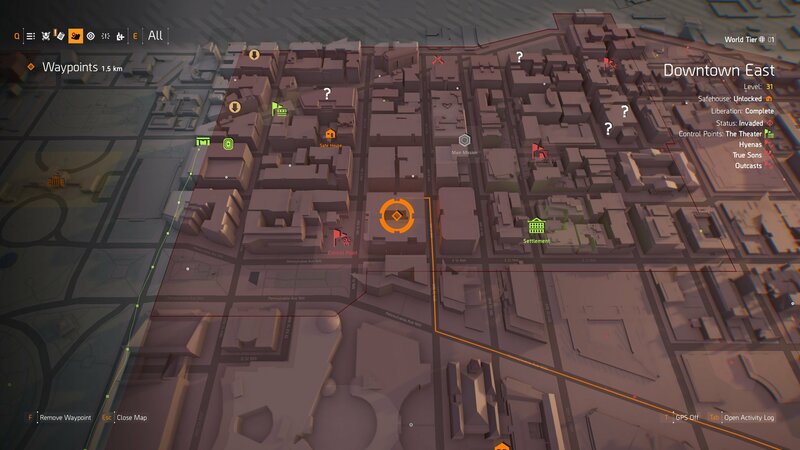 A second mark can be seen on the map, with the word “X marks the spot”. From here you’ll need to move to a new location nearby. 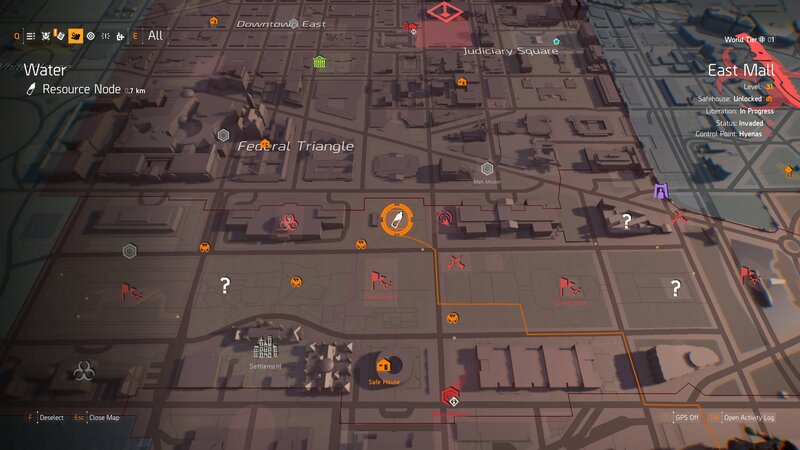 You'll find the Hunter that drops the Ghoul Mask by heading to this node on your map. After heading to the location marked on the map above, look out for a blinking light on one of the small watchtowers. Aim at the light and then shoot it. This will cause a puff of smoke to appear, as well as this Hunter. Kill the Hunter to claim the Ghoul Mask for your collection. The next set of Hunter Masks you can get are the Midas and Revenant Masks. To acquire these masks, navigate on your map to West End. Close to the waterfront, you should see a building shaped somewhat like a backwards crescent moon. 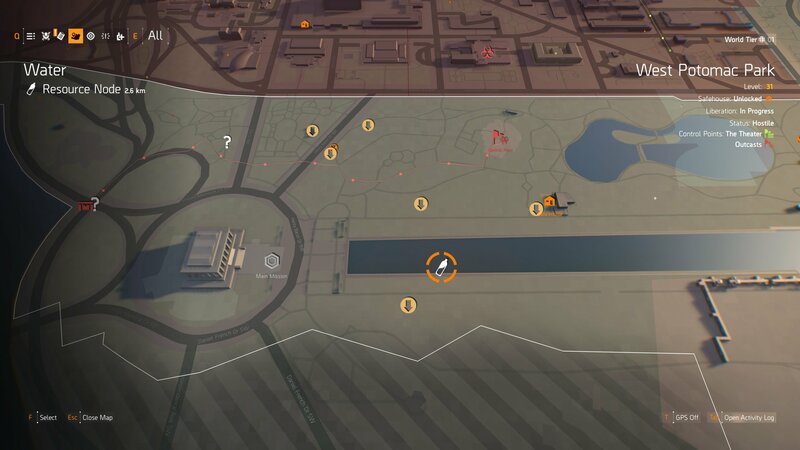 If you haven’t already completed it, this is also where you can find the Potomac Relief Camp side mission. 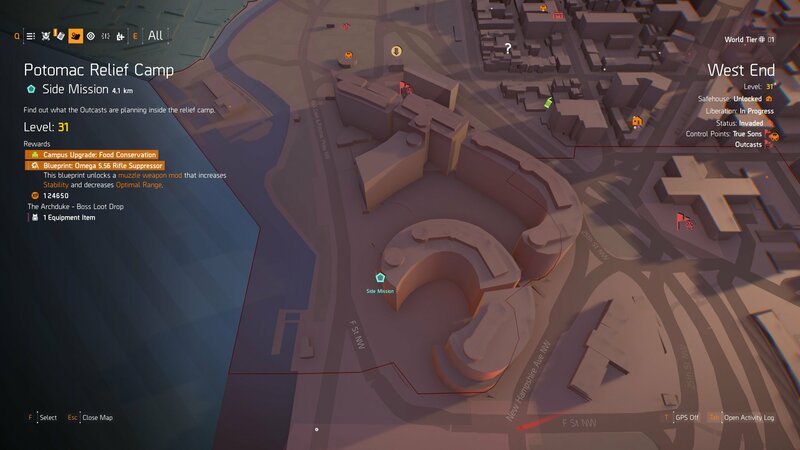 Look for the swimming pool at this location, and then complete jumping jacks in it to spawn this pair of Hunters. Head into the area here, though, and look out for a drained swimming pool. Once you find the pool, climb into it, and then use the jumping jacks emote to spawn two Hunters. Killing them both will reward you with the Midas and Revenant Masks. Finding this next Hunter Mask is going to require you to travel over to the eastern side of the city, to the Southwest district. Here you’ll find a monument wall with several names written on it, as well as a singular light shining on the wall. To spawn this particular Hunter, you’re going to need to stand behind the light, make sure you are out of the fountain in front of the memorial wall—and then salute the wall. This will spawn another Hunter. 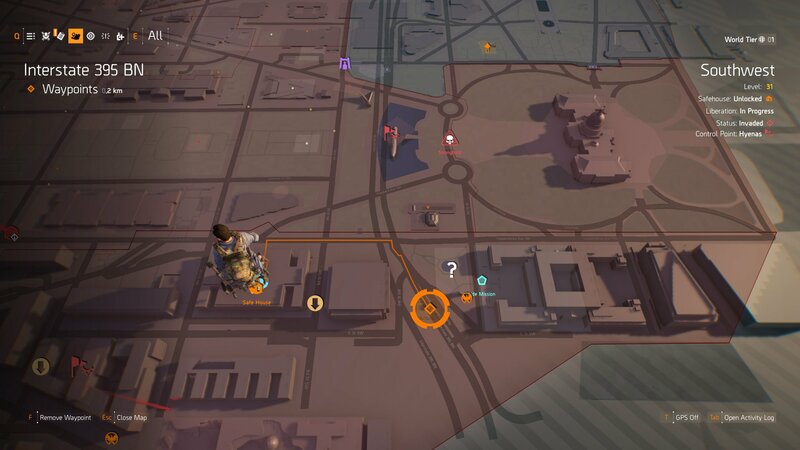 Look for the memorial wall at the location we've marked above and then salute it to spawn this Hunter. Take this Hunter out to claim the Wraith Mask for your collection. Next up is the Crimson Mask. To unlock this Hunter Mask, you’re going to need to make your way over to the western border of Judiciary Square. Just to the west of the District Union Arena Stronghold you can find a courtyard with doorways on either side. Look for the set of two doors with a mirror in between them. Head into the doorway on the left and look for a small laptop that you can interact with in the room beyond. Head into the courtyard just southwest of the District Union Arena stronghold to find the area you'll fight this Hunter within. After you activate the laptop, head out of the room, through the courtyard, and through the set of doors on the other side. Here you should find another counter area, where you can interact with a phone. Interacting with the phone will cause a puff of smoke to appear outside, summoning this Hunter for you to fight. Take it down to claim the Crimson Mask. This time around you’re going to find yourself fighting against four different Hunters, all at the same time. These are by far the most difficult masks to acquire due to having to take on four of the Hunters at once. Because of the nature of this encounter, I highly suggest bringing some friends along to help. Taking on this encounter will reward you with four new Hunter Masks for your trouble. When you’re ready, make your way to the area marked on the map above. Here you’ll find an open courtyard area with a Christmas tree in the center of a fountain area. From the tree, head up the stairs to the side and into an office. There is a level here that you can activate (this level will only work at night). After you flip the lever, head back outside and run around the tree. This will trigger the Hunter spawns. As I said before, this encounter is extremely difficult due to having to fight four of the Hunters at once, so make sure you bring your A-game and have full magazines before triggering it. Finally, the last Hunter Mask that players will be able to unlock is the Demon Mask. This mask can be found by traveling to the shopping area just east of the Demolition Site Control Point in Downtown East. Head inside, down the escalators, and then follow the path until you make your way to a small grassy platform. Head to the shopping mall area next to the Demolition Site Control Point to take on this final Hunter. From the platform, look out across the area and you should see several windows. Here you should be able to spot a series of targets. 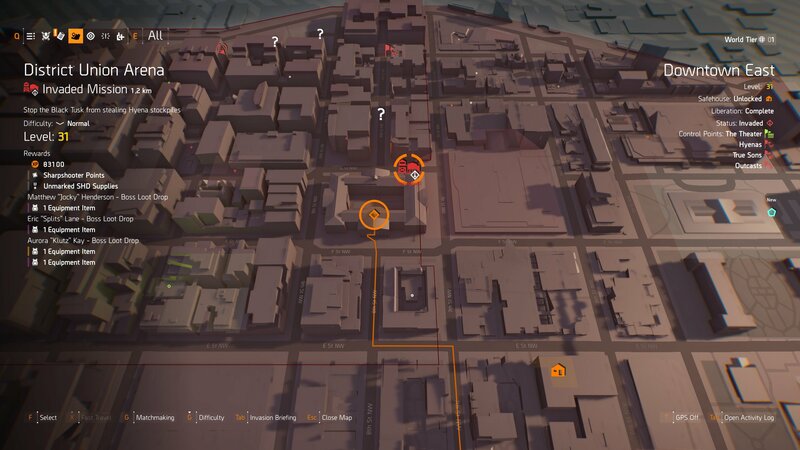 Shoot all of these targets from top-to-bottom and the final Hunter will spawn. Take this Hunter down to acquire the Demon Mask, rounding off your collection. 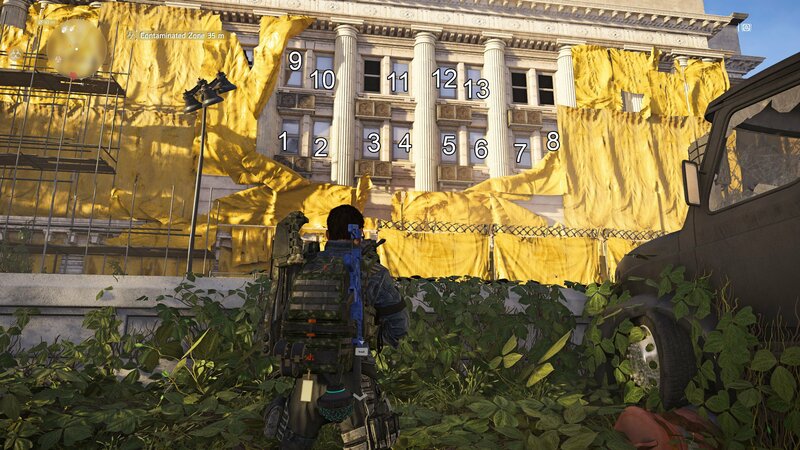 Now that you know how to get all of the Hunter Masks, make sure you return to our The Division 2 guides for more help. I've been meaning to track these down, thanks!